Vickie's Kitchen and Garden: My Goals for 2018! Another year has gone by and it's time to set new goals. I've learned a lot in the last year about my goals. Some of them were just not meant to be because I couldn't fit them in my life or now they are forever ingrained in my life and I will just do them. For instance, the blogging goals last year were all about knowledge and numbers. I found that I didn't have time or money to take many blogging classes although I did take a few. My last year goal of volunteering will and should always be in my life. I will just do it! It's a goal that has become ingrained and I love helping others. Then there are others that I need to strive and reach for throughout the year. That is the purpose I guess of setting goals so here it goes. With the exception of #1 they are not in order of importance. Sometimes I fail but I keep trying! 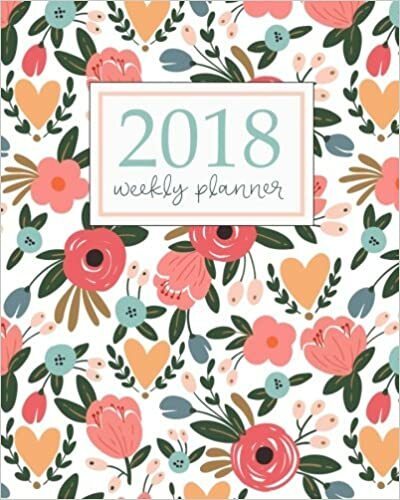 My life a little: I bought a new planner this year and I can't wait to keep all my appointments, blogging duties, and fun all in one place. I have found that my calendar cannot hold all the little things I need to be reminded of. Mother used to leave notes on the table but she didn't have a pretty planner. I found this one on Amazon. My house: I want to organize more of the house that guests can see when they come to visit. Like for example the front closet that is always seems to stay open. This is where the games for the children are kept and it always looks like a mess. This will be cost a little for storage bins etc. so I'll wait till after no spend January. 3. Get healthier. Eat better, exercise more! I lost 12 pounds last year and I hope to lose more this year. I also need to fit exercising more in my everyday life. Just basically take care of myself more. We are important! 4. Improve where we live and remodel the house a little. We usually fund this with our no spend January (I'll post more about this next week). Inside: This year we need to redo the front porch area with a new screen door and the side lights. The side lights right now are Plexiglas that have permanent tape marks on them from previous holiday creations made by our now grown children. The screen door is just a mess. Outdoors:I need our new used clothesline that we bought at a garage sale put up. After I put two heavy comforters on my old one it's leaning heavily to one side. I kept on using it the rest of the season with the promise of installation of the one in the garage this Spring. I would also love new different outdoor patio furniture. Everything this year has to wait for warmer weather! 5. Read 60 books a year and keep track of them on Goodreads.com. I may surpass this number because I've decided that I will review all books I read not just the ones I review on the blog. This year I missed my goal of 52 books by 9 after I review one today 😏. 1. Giving my blog look a overhaul. One day you will come by and I will have a make over. I'm not good at these things as you can tell so maybe I'll hire it done. I don't know...I'm pretty cheap frugal! I hope it will be new and not terrifying! 2. Remembering to take my camera so I can share more. I love to take pictures but so many times I run out the door without it. 3. Try to post more regularly. I have skipped a few days in the last year. I hope that I can get a better handle on this. Thanks to all my readers this year! It's been a wonderful year sharing with you everyone.